Statesman Academy, located in sector 34A, Chandigarh, is the city's one of the most renowned institutes which provides coaching for Banking, SSC, UGC-NET, CSIR UGC-NET, LAW/CLAT. 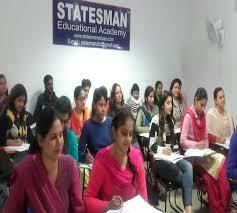 Statesman Educational Academy is the premier coaching institute and the leader in CSIR-UGC-NET Coaching in Chandigarh. UGC- NET is an essential eligibility criterion for the selection of Assistant Professors in various colleges and Universities. As hundreds of vacancies of Assistant Professors in various subjects are lying vacant in colleges, state Universities and central Universities, the significance of this exam has increased more than ever. As a coaching institute, its endeavor is to fully equip the students for this examination. The main focus is to provide specialized coaching for different subjects, so that maximum students get to benefit from our programs such as Regular Course, Weekend courses, Crash Course and Distance courses. The Academy has well experienced and well-dedicated teaching staff, due to whose hard work and concern, the institute is currently listed among the top academies in Chandigarh. the brilliance of the institute is showcased by the rating chart of the career of the institute. the study material which is provided to the students who are enrolled with the institute is simplified so that they have an extra edge over others for problem-solving in less time during the examination. This is best CSIR UGC net coaching institute in Chandigarh. Superb academy...awesome results.many people gets best opportunity for their entrance exams.my thanks to all those teachers who taught me in this academy. 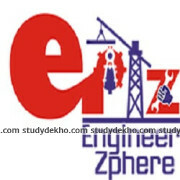 Excellent... Amazing academy.This acquired very good results.Many people gets great opportunity for entrance exams. Amazing!! 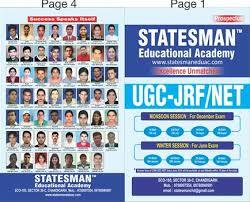 This is very excellent acedemy.From this many students get good results.They gets good job by this help. Wow ! This is very amazimg institute for all competition exams.well.so much interested and helpful. .